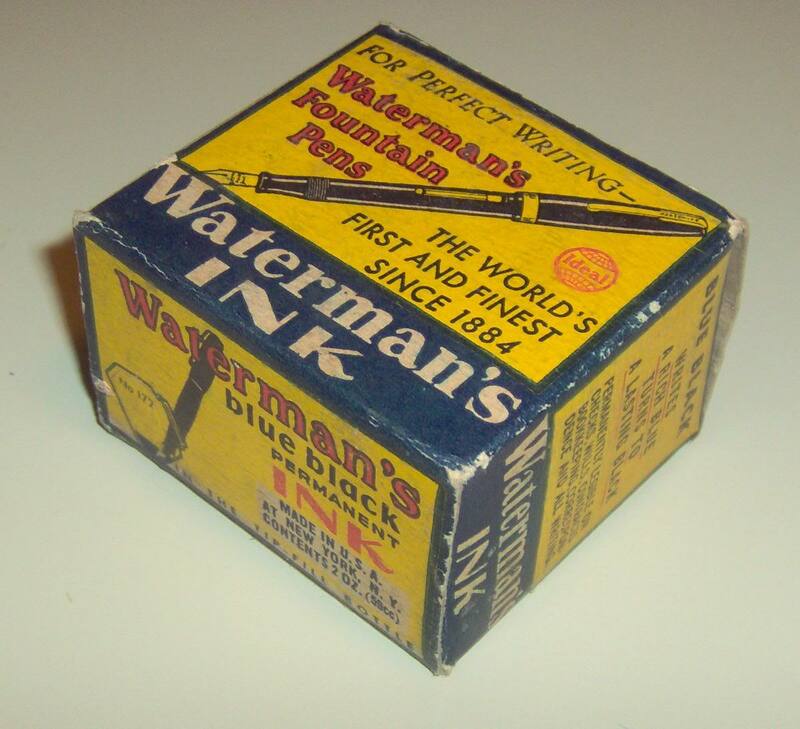 Waterman inks are another example of in-house maker’s ink; nothing that will drive the world mad with either glee or dispair (although in one case, dispair is possible). The writing characteristics of their inks are generally pretty good, and their colours tend to be a little more than merely adequate (with that exception…). Something the traditionalist in me enjoys is the fact that the shape of bottle has remained the same since the mid-1940s, and it is a highly functional shape to boot. Black: Its… black. Those who get very excited about absolute blackness in their black inks tend to discount this one a little, though. Blue-black: The disappointment in Waterman’s inks. Similar to Parker’s version of this colour, it is given to fading into a greenish tone; many people think blue-black is supposed to be green, thanks to this ink. It seems somewhat less likely to disappear entirely than the Quink, but it is still a bit of a slap for those who want to use something of a dark blue nature. During the great ink renaming of 2012, this was re-dubbed as “Mysterious Blue,” which seems appropriate, because it’s likely that whatever is written in it will eventually vanish. Florida Blue: The standard blue as Waterman understands it. It was renamed to “Serenity Blue” in 2012. It is a little less vibrant that it appears in this scan, having a grey undertone. Blue-black(vintage): The packaging on this ink gives a sense of the traditional meaning of blue-black; a chronological progression rather than a blending. The effects of several decades in the bottle means that it goes on the paper bluish and turns… darker, but it is still waterproof once it’s dry. My bottle is from no earlier than 1944, and with that pen in the box probably not much later than 1953. Blue (vintage): Once again, one must allow a little for entropy. This is roughly contemporary with the blue-black above, and gives a slightly dark medium blue, similar to Herbin’s Bleu Nuit.